Microsoft has many versions of its products out there. 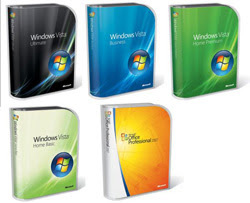 Just Vista alone has 5 different versions (10, if you count the fact that each version can be standalone, or an upgrade from XP). What I'd like to do in this post, is bring to the light a couple of product versions that are less commonly known, but are interesting, none the less. There are many other products and versions, but I leave you the joy of unearthing them. Drop me a comment if you think I should add any of them to the post. Windows XP Home/Professional N - following their agreement with the European Commission decision, Microsoft has produced versions of XP with no Media Player and files (the "N" stands for "No"). This version is light on files, codecs and other things that Media Player pushes into your system. Just install it, drop VLC on it - and you're good to go. Sadly, this version is only for sale in Europe - but you can get it off your friendly-neighborhood MSDN. More about this version, along with a list of 186 files taken out of it can be found here. A computer with 233 megahertz or higher processor clock speed (300 MHz is recommended); Intel Pentium/Celeron family, or AMD K6/Athlon/Duron family, or compatible processor is recommended. 64 MB of RAM. 256 MB of RAM is recommended. 610MB disk space (1150 if you install all the options). And yes, just like version N, it can be installed without Media Player and Internet Explorer (and a bunch of other stuff). FLP comes with the capacity to record, or script a system installation, and repeat it, either from a CD, or over the network. An IT manager can now deploy XP to all machines on his network with one key-click. This is so much better than ghosting. But my most liked feature - you can deploy the whole OS from a USB drive. Some tutorials will actually show you how to boot from the drive. Sadly, I can't tell where and how to get FLP. MS is not fond of giving/selling it, because it tends to find its way to all kinds of platforms MS doesn't like (OLPC, Asus EEE - which was where I've seen it first, to name a few). Good luck finding a version on your own . Read this post for more data and screen shots. Outlook 2007 with Business Contact Manager - this version of Outlook 2007 is a self contained CRM. No need for Exchange Server at the end. This version is geared more towards the sales and marketing crowd. It replaces the stunted contact feature of Outlook with an enterprise-level one, which is account-oriented. Again, this version doesn't see a lot of publicity, since Microsoft would rather your organization purchases the full Office 2007 suite + an Exchange server or two. Find out more about this useful version of Outlook in its product page. VS Express Versions - Finally, if you're interested in using Visual Studio 2008 (and haven't downloaded the free VM image I recommended before) and can not afford to pay for your version, try the Visual Studio 2008 Express versions. They are FREE. The applications you'll develop with them are not limited in any way. This is Microsoft's way to get the community of hobbyists, code hackers, students, kids and people who dabble in programming, hooked on VS. For my money - it's a great idea and I thank Microsoft for making those versions available.